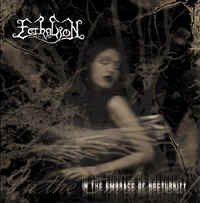 Ecthalion was founded in summer 1998, partly to protest against the abundance of similarly sounding black metal acts. I had met Lauri (guitars, vocals) in a radical black metal band 'Tarbatu', and soon the idea of composing something more melodic occured to us. First songs we composed were actually styleless. Rather soon our music took the form of slow, depressive gothic/doom inspired mainly by Katatonia's "Dance of the December Souls". This style not being popular at the time, it was quite hard to find a stable (and able) lineup. 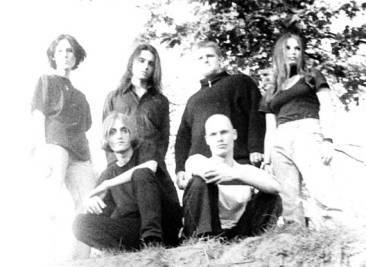 That is why we consider the real beginning of the 'band' to be summer 1999, when Kristjan, our new drummer, joined Ecthalion. For almost a year of frequent live performances, the band gained popularity in the Estonian metal scene and developed musically, in places braking the boundaries of what is usually called 'doom' or 'gothic'. In summer 2000 we felt confident enough to record our demo (or a 'debut album', if you wish to say so) called 'In the Embrace of Nocturnity'. Though it may sound raw and 'hand made', the feedback was (and surprisingly still is) quite positive. Just as a remark, after releasing the demo, we decided to stop using those pseudonyms you may find in the booklet. Soon after the release of 'ItEoN', darker times arrived for the band. For almost 2 years we suffered from all kinds of unpleasant surprises like constant changes in lineup (crucial members decided to leave; all but me and Kristjan had to be replaced; potential new members lacked interest or ability) and motivational crisis. I personally was on the very edge of giving up quite a few times. Then again, the 'core' of the band (at the time Kristjan, Raul and Alice) just didn't let me resign. Can't thank them enough now for their support. Well, it lasted until we were asked to be one of the local warm up bands for BEHEMOTH in september 2003. Given the circumstances, it was a pleasant and unexpected surprise. This live restored our will and energy. All respect to Mart Kalvet (Herald, Whispering Forest), one of the most talented vocalists in the Estonian metal scene, who offered his helping hand and and made that performance possible! Currently we are working on the new material in the studio and besides that, looking for a new drummer, as our long-time member Kristjan decided to leave the band.